Multiple missing teeth can be a true burden in a wide variety of ways. They can make you less likely to smile because you feel self-conscious, and they can also affect your ability to eat and speak comfortably. At Harrisonburg Family & Cosmetic Dentistry, we help patients faced with this problem by using custom-made, natural-looking dentures and partials. 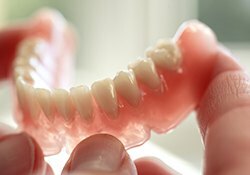 Modern-day dentures are much different than anything your parents or grandparents might have worn. Now, these prosthetics are smaller, sleeker, and more comfortable than ever, consisting of a gum-colored acrylic base attached to realistic-looking teeth. A partial (also known as a partial denture) can be used to replace multiple missing teeth along a single arch while fitting in seamlessly among a patient’s remaining teeth. They can be fabricated to fit a patient’s unique dental structure, and they are held in place using small clasps that attach to neighboring teeth. Alternatively, if you are missing an entire row of teeth, we can restore it using a full denture. This will sit directly on the gums using natural suction and/or a bit of denture adhesive. No matter what kind of denture you need, our team will make sure it fits comfortablly and enables you to smile confidently. 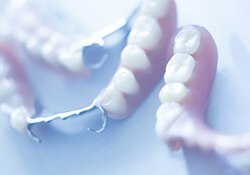 Typically, it takes a few appointments spaced out over the course of a few weeks to get a denture designed and placed. Of course, once your new dentures are completed, we won’t simply send you on your way. Your dentures will need periodic maintenance over the years, and we’re happy to take care of that too. Thanks to our in-house lab, we are able to provide same-day repairs and relines as you need them. Should your dentures start to feel uncomfortable or become damaged for any reason, just give us a call and we’ll fix them right up.